Wish you had seen stars like Elvis, or Buddy Holly or The Beatles? Well, now you can in Calvin Gilmore's all-new, all-live show Tribute! The Concert. It's an intimate and unforgettable evening with America's favorite "celebrities." With every note, every gesture and every nuance our artists re-create classic performances by superstars of yesterday and today. Tribute! 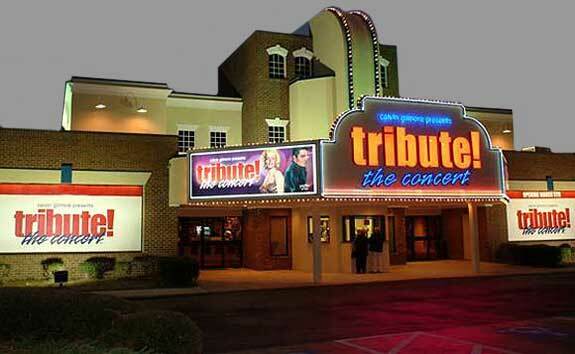 features a rotating cast of the country's top tribute artists. And in the Calvin Gilmore tradition, these incredible performances are backed by a hot live band — and dancers — for a live entertainment experience second to none. And a photo session with a "star" will make your night complete. See the "superstars" of yesterday in the concert performances you missed — along with today's hottest "celebrities" — in a comfortable and intimate setting, for an evening of pure energy and excitement. Tribute! The Concert. Ticketing: 843-913-4444 or 800-313-6685. Groups of 20 or more: 800-633-1508.